Depending on the working width, the hopper capacity is either 3000l (3m and 4m) and 4350l (6m). The hopper of the rigid u-drill is divided lengthwise and the two metering devices are accordingly positioned either side. The proportion: grain and fertiliser is 40 : 60. The u-drill plus is especially adapted to suite the need of precise fertiliser placement at the seed. These crops can show substantial yield increase when applying fertilser with a relatively high percentage of phosphate together with the seeds. In Scandinavian and Eastern European countries the fertiliser is usaually placed between the rows besides and below the seed, whereas in other countries e.g. Scotland the preferred method is to apply both seeds and fertilser in the same row. In trials of spring sown crops, yields have shown increasses up to 25% compared to crops where ther fertiliser has been applied by other methods. The narrow profile of the coulters with their slightly offset steel discs allow easy penetration into the soil. Thus, little pressure is required in this step and only little soil is displaced. The coulter pressure of 100kg can, therefore, be primarily used for the pressing by the integrated press wheels. 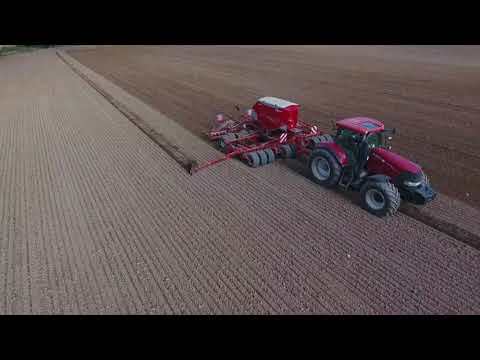 The result: a uniform seeding depth even at high working speeds! 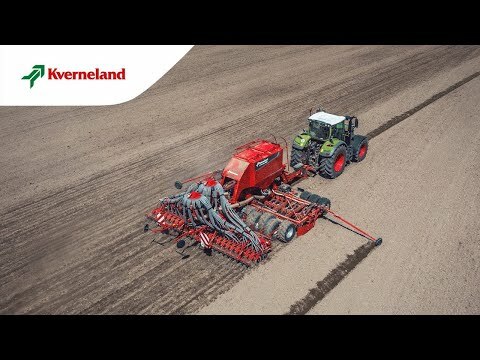 The seeding depth and the coulter pressure can be centrally controlled by the push of a button from the tractor cab – this saves additional time. The new metering device is electric driven by e-com and is fully ISOBUS compatible.